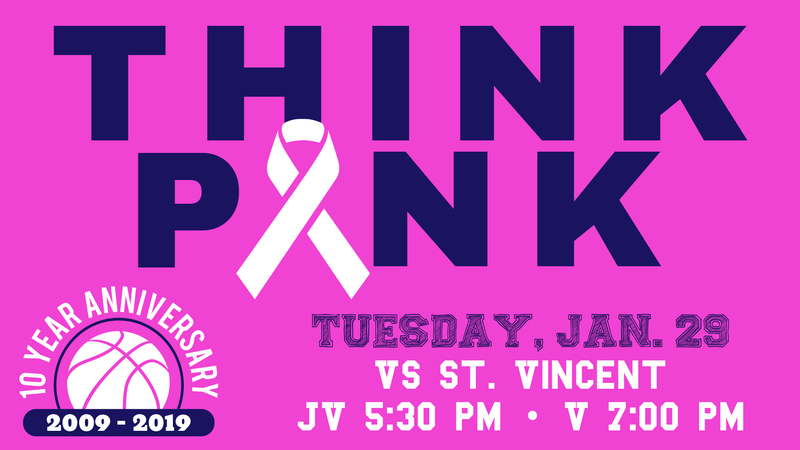 The Lady Lancer basketball team is bringing awareness to breast cancer at their game on Tuesday, January 29 against St. Vincent. Join us for our 10th Annual Think Pink basketball games. JV starts at 5:30 pm and Varsity will follow at 7:30 pm. Come out and cheer on the Lancers, watch a spectacular half-time performance by our Lancer Dancers, and raise money for a great cause. Bring the family and tell your friends. Let's fill up the Ralph Boyer Gym with fans all dressed out in the SPX THINK PINK t-shirts. T-shirts will be available for purchase before the game. Proceeds from the Think Pink games will be donated to Mercy Jefferson.